The summer of 2010 was largely a painful mess. I had moved to San Francisco in April, and by late May was very ill with a sinus infection that would eventually require months of antibiotics and two procedures to clear out. On the work side, Sun had been bought by Oracle, and we were in the throes of a merger that caused enormous pain to most former Sun employees. I had an office in building 18 of Sun’s Menlo Park (MPK) campus, but I didn’t spend much time there. The building already seemed very empty: whole teams had been laid off, and those remaining preferred to work from home so as not to be constantly reminded of those who were gone. By midsummer, we knew for sure that MPK would be sold and we’d all be moving to Sun’s Santa Clara offices. As a minor part of preparing for the move, I was asked to clear out 10 or so storage rooms that had belonged to various groups. I was ideal for this assignment: I’m very good at sorting and packing. I also hate waste, so I was anxious to find good homes for as much stuff as possible, though this was a lot more work than just “recycling” it all. Over 3000 t-shirts. Most had been made for OpenSolaris user groups (why were there so many for Poland?!?). We were no longer allowed to give these away outside the company, because the OpenSolaris brand had been “deprecated”. Hundreds of baseball caps, also OpenSolaris-logoed. Ditto. A gigantic shipping pallet full of copies of the OpenSolaris Bible . The information in them was (and is) still useful, but, again – wrong branding. Hundreds of copies of Solaris Internals , Solaris Application Programming , and others, but only 28 of Solaris Performance and Tools – which proved to be the most in-demand of the books. Huge amounts of office supplies, which we gave to a program that gives this stuff to teachers. There were a few unique items, such as Solaris-logoed boxer shorts. Thousands of plastic license plate frames intended for a dismally-failed promo for the Sun cloud (nothing to do with these but put them in the recycle bin). 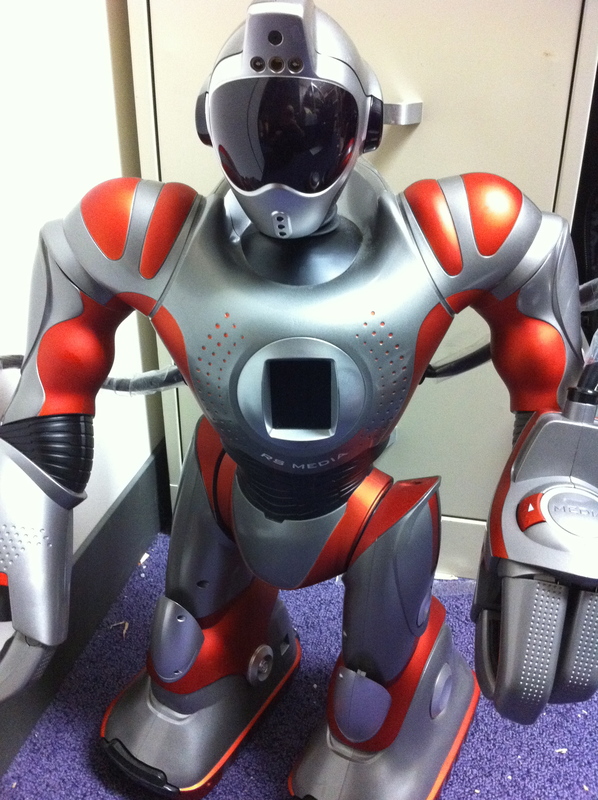 ^ I found two of these robots in a closet that had belonged to the Java team. Online research showed that they had been part of one of Gosling‘s toy shows at JavaOne some years before. They came home with me; one has since gone on to pursue a career in Hollywood, the other is at the Joyent offices (matches the decor) went to live with Ben Rockwood’s family. I assume that Number 3 still lives with Gosling. 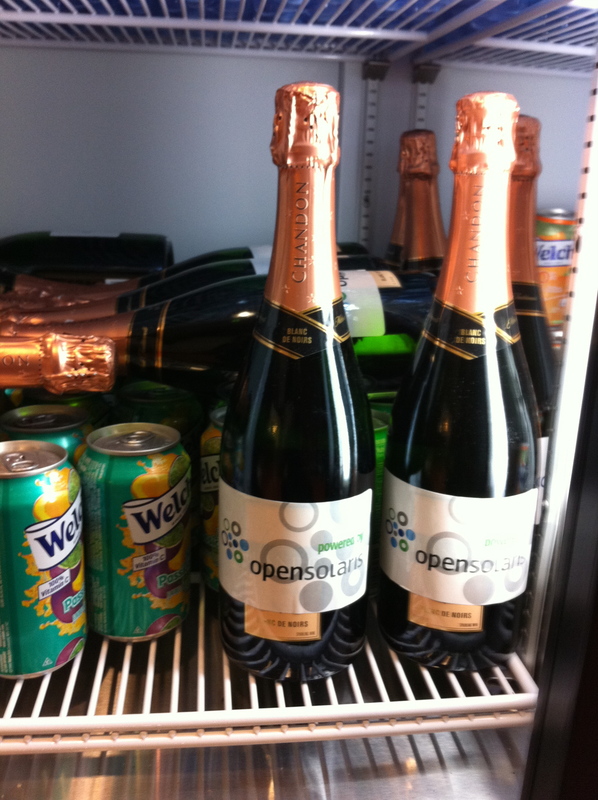 I remembered this: it had been served at a party during CommunityOne in 2008. Lynn and I snagged a case of the remainders to take back to our colleagues in Broomfield. The case or so that I later found in a store room in MPK we served at a farewell-to-MPK party in August, 2010. Making endless trips between buildings with trolleys full of heavy boxes, I consolidated all the books and apparel into one large storage room. 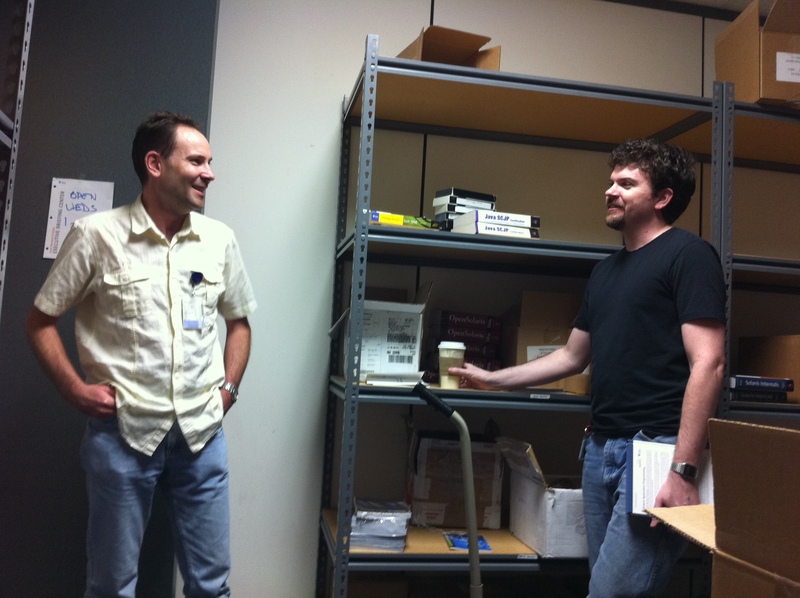 Then I advertised within the company to find “buyers.” To my surprise, everyone wanted an OpenSolaris shirt. None had been given out within the company: only people who had attended conferences and user group events had them. Which left out most of the engineers who had actually created (Open)Solaris! So I packed up dozens of shirts to send to Sun offices around the world. I took piles of stuff to the engineering meetings that I attended as part of my regular job – which turned out to be a good way to warm up engineers who were previously too shy to even speak to me. But there was still a lot of stuff left. Towards the end of summer, when I was on a deadline to get Building 18 cleared, I started having lunchtime “store hours” when people could come rifle through piles of shirts and pick up books. An Oracle VP of software drove down from Redwood Shores to get copies of Solaris Internals for his team – said he didn’t have budget to buy them. ??? Dozens of people came to grab some remnants of Sun history. There were historic encounters, such as the above meeting in my storeroom/showroom between Solaris book authors Darryl Gove and Brendan Gregg. Some of the schwag has had interesting later lives. Several dozen hats went to a church, to help keep people together during a hike in Yosemite. Another bunch ended up at a school event, and are still seen on that campus today. I gave a hat to a friend who had nothing to do with Solaris, but now gets chatted up by random geeks in San Francisco whenever she wears it. 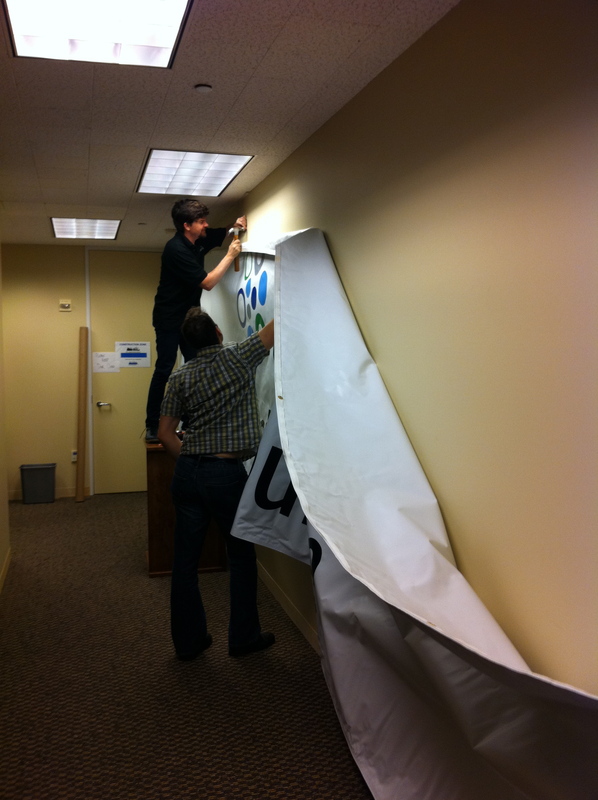 ^ One of the largest things we kept was this 40-foot banner, which we later used to decorate a Solaris Family Reunion. On August 3, 2010, Garrett D’Amore announced the illumos project. 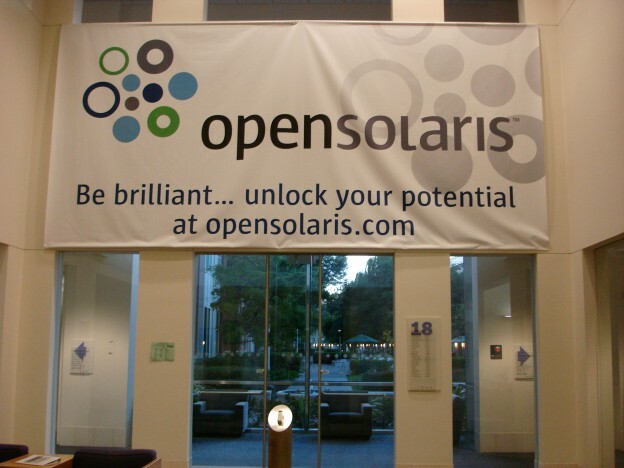 On August 13th, a memo was “leaked” from within Oracle, announcing the death of OpenSolaris. This entry was posted in bio and tagged Illumos, OpenSolaris, Oracle, Solaris, Sun Microsystems on May 21, 2012 by Deirdre Straughan. 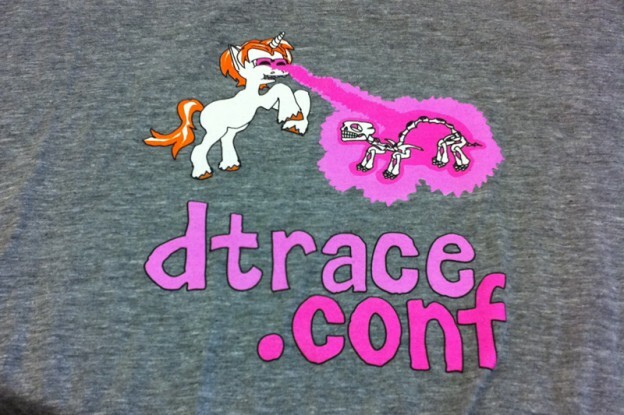 ^ above: the famous DTrace laser pony designed by substack. Why a pony? Read here. This week was eventful for me professionally. I organized and ran dtrace.conf 2012, a highly technical conference, for my employer and others of the tech community that works with this technology. Yes, this is the same DTrace as in that book that I edited in 2010. I also filmed it and ran a live video stream, while publicizing it via Twitter. And making sure everyone got fed and, at the end of the day, had beer to drink. A very busy day, but all went very well. The final, edited video is now making its way to YouTube, see the playlist of videos above. This entry was posted in portfolio and tagged Brendan Gregg, DTrace, Illumos, SmartOS on April 8, 2012 by Deirdre Straughan. 123 videos I did for Sun and later Oracle, plus a few later, can be found on my old YouTube channel. This entry was posted in portfolio and tagged Illumos, SmartOS, Solaris, Sun Microsystems on February 2, 2012 by Deirdre Straughan. A new feature being introduced in illumos, presented by Chris Siden of Delphix at the illumos user group meetup sponsored by theÂ Joyent Cloud, January 2012. Christopher Siden at the illumos user group meeting sponsored by theÂ Joyent Cloud, January 2012. Discussion at the illumos user group meetingÂ sponsored by theÂ Joyent Cloud, January 2012. Matt Ahrens speaks at the illumos user group meeting, January 2012. John Kennedy of Delphix speaks at the illumos User Group meetup, January 10, 2012. 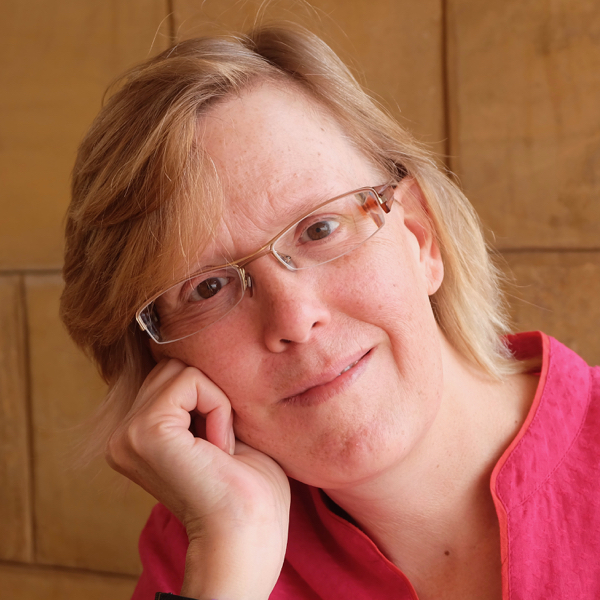 This entry was posted in portfolio and tagged Illumos, ZFS on February 1, 2012 by Deirdre Straughan. Robert Mustacchi’s talk at SCALE 10x. An excellent introduction to what SmartOS is and why it’s better. Want to learn more? Come meet Robert atÂ the Joyent Cloud Meetup/Office Hours Jan 31. 5-7 pm. Beer and pizza provided! This entry was posted in portfolio and tagged Illumos, Joyent, KVM, Robert Mustacchi, SmartOS, video on January 30, 2012 by Deirdre Straughan.